Since an in-place update from 0.4.X to 0.5.X (so for a couple of months now), import/sync doesn’t seem to be working for me. Recent Steam games I’ve installed through the Steam client don’t appear in Lutris after it starts, and clicking Import Games -> (checkbox of game or all games) -> Import manually does nothing. Connecting to GOG and trying to import those games too, similarly, doesn’t do anything. Here’s the lutris -d terminal output of me opening lutris up, waiting for sync to take place, then trying to manually import Steam games https://pastebin.com/P6qrJXui. Does Lutris list the missing games when you go to the import menu? Yeah, it does! The import button just doesn’t seem to have any effect. This shows me trying to add/import GTA Vice City, currently installed on Steam, to Lutris. The Import games button has no effect. Also note sync is on, but GTA wasn’t added at startup. Ok, I just found this bug report. If I understand it correctly, Lutris imported those Steam games before you had them installed (You probably synced your Steam library with your Lutris account) and therefore marked them as uninstalled. The above mentioned bug causes Lutris to not detect when a previously uninstalled Steam game is installed. It’ll probably be fixed in the next release. GOG games are similar. 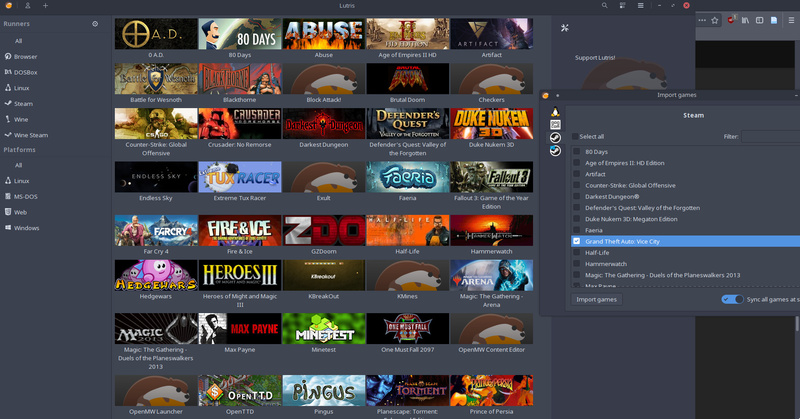 After importing them from your GOG account you still need to install them. In Lutris there is an option to hide uninstalled games which, judging from your screenshot, seems to be enabled. You can disable it by clicking on the hamburger button on the top right of your application left to the minimize button and then unchecking the “Installed Games Only” box. That way it will show you all your uninstalled games. Ah-hah! That bug report looks exactly like my issue. I didn’t see that report in my initial search, thanks for pointing it out. Guess I’ll sit tight and wait for the upcoming releases. Thanks again!